In the August 2014 issue of National Geographic, there's an interview with Jane Goodall about the early days of her study of the chimpanzees in Gombe National Park in Tanzania. Her work there began in July of 1960. Then, in 1962, she went to Cambridge University to earn a Ph.D. in ethology (animal behavior). She was told by her academic advisors that she was doing everything wrong. She had given each chimpanzee a name, and she had recorded anecdotes that displayed their individual differences in their personalities--in their emotions, motivations, and thoughts. All of this was condemned as unscientific, because it was not reductionistic in reducing everything to patterns of data, and because speaking about animals as having individual personalities was regarded as an anthropomorphic projection of uniquely human traits onto nonhuman animals. As is indicated by the title of her magnum opus--The Chimpanzees of Gombe: Patterns of Behaviour (1986)--she did collect and analyze data from her research so as to show behavioral patterns, but she also told stories about the chimpanzees of Gombe as unique individuals with different personalities. So, for example, she could show patterns of dominance behavior with both male and female dominance hierarchies; and she could predict that every chimpanzee community will tend to have such a structure of social ranking. But she could also show that individuals were highly variable in their propensities to dominance. Some individuals were by temperament more ambitious than others. And it was not possible to predict precisely which individuals would become alpha male or alpha female, because this depended on the historical contingencies of unique individuals interacting in unique circumstances. Only after a power struggle had brought one individual to the top could the scientists at Gombe retrospectively reconstruct what had happened. Similarly, once the Kasekela Community had conquered the Kahama Community in a war and annexed its territory--a war that began in 1974 and ended in 1978--Goodall could reconstruct the history of what had happened. But the war was a shocking surprise to her, because she had been reporting that the chimpanzees did not kill members of their own species. Now she and her colleagues can see that there are three communities in Gombe, named for three rivers in their territories, with clear borders between them: the Mitumba Community in the north, the Kasekela Community in the middle, and the Kalande Community in the south. Males form border patrol parties, and if they find that they outnumber their opponents, they will viciously attack and sometimes kill members of other communities. Goodall and colleagues such as Richard Wrangham and Michael Wilson argue that we can see here the evolutionary roots of warfare among our primate ancestors. As I have indicated in various posts, this has set off an intense debate with those who dispute the evidence for warfare among chimpanzees and human foragers. Like all social sciences, ethology or animal behavior is a historical science that studies the unique history of unique individuals in unique communities. In such a historical science, one can predict general patterns; but one cannot precisely predict the future. And so, as I have argued, a biopolitical science will have to be a science of the political history of primates that will include ethological science. I disagree, therefore, with those proponents of biopolitics like John Hibbing who assume that a biological science of politics cannot include ethological history. The research at Gombe is now directed by Anne Pusey as director of the Jane Goodall Institute for Primate Studies at Duke University. 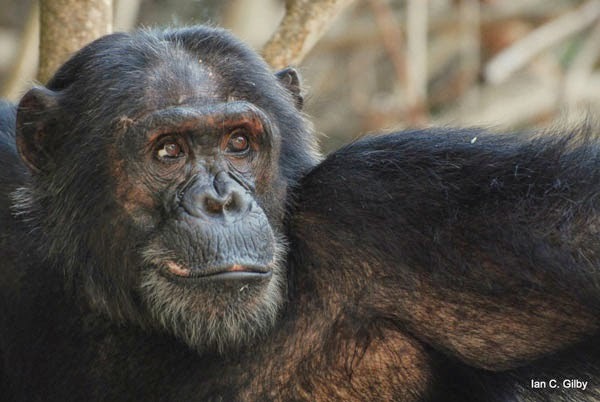 This research allows us to see the continuing history of the Gombe chimps. Much of this history is presented in a beautiful book of photography with extended commentary--Tales from Gombe by Anup Shah and Fiona Rogers (first published by the Natural History Museum of London and then by Firefly Books, Buffalo, New York, in 2014). Shah and Rogers explicitly identify themselves as photographers rather than scientists, and so their writing does not have scientific rigor. But they do tell engaging stories. And their photographs are stunning. For more rigorous studies, one needs to turn to the work of Pusey and her colleagues--for example, Emily E. Wroblewski, Carson M. Murray, Brandon F. Keele, Joann C. Shumacher-Stankey, Beatrice H. Hahn, and Anne E. Pusey, "Male Dominance Rank and Reproductive Success in Chimpanzees, Pan troglodytes schweinfurthii," Animal Behaviour 77 (2009): 873-885. Shah and Rogers continue Goodall's emphasis on the unique personalities of the chimpanzees and their unique life histories. In fact, their photographs are their most convincing evidence for this, because we can see the different characters and emotional temperaments displayed in their faces. This continues a tradition that goes back to Darwin's Expression of the Emotions in Man and Animals (1874). Like Goodall, Shah and Rogers show that becoming the male leader is not determined just by size and strength. Since March of 2008, the male leader has been Ferdinand, who has formed an alliance with his elder brother Faustino, who is ranked number two. The biggest and strongest chimp is Titan, but he is only number three. Titan is ambitious, but he lacks the confidence, the mental stability, and the shrewdness of judgment displayed by Ferdinand. Shah and Rogers cannot predict who will be the next alpha male. They speculate that if Ferdinand were to be weakened by illness, or if Faustino were to remain neutral in a fight between Ferdinand and Titan, this might give Titan the opportunity to take the number one position. But they admit that knowledge of past history is not enough to predict a future that depends on contingencies. Shah and Rogers might also have mentioned another source of historical contingency--the cultural diversity in chimpanzee politics. Every chimpanzee community has a unique political culture as shaped by its unique history. Consequently, as I have often suggested on this blog, a biopolitical science would have to move through three levels of evolutionary history--the natural history of the political species, the cultural history of the political community, and the individual history of political agents. What exactly is the benefit of becoming the politically dominant male? One obvious possibility from a Darwinian perspective is that higher male dominance rank gives greater access to females and thus reproductive success. But it has been hard to test this in the wild. Pusey and her colleagues determined the paternity for 34 offspring over a 22-year period for the Gombe chimpanzees, and they concluded that male reproductive success did generally come from dominance rank creating priority of sexual access. But they also saw that lower-ranking males sired more offspring than predicted. They write: "our study confirms that male rank generally correlates with reproductive success. However, younger males had the highest success per male, and low-ranking males successfully produced offspring more often than was predicted by the priority of access model. Low-ranking fathers sired offspring with younger, less desirable females and appeared to use the consortship strategy more often than higher-ranking fathers" (880). I see no reason why such scientific study of chimpanzee politics should not be part of political science and political philosophy. A biopolitical science would fulfill an intellectual vision originating with Aristotle. Although Aristotle did not identify chimpanzees as political animals, he did study them carefully and identify them as the animals most similar to human beings. Aristotle also recognized that nonhuman animals had unique personalities and cognitive abilities. He observed: "in a number of animals, we observe gentleness or fierceness, mildness or cross temper, courage or timidity, fear or confidence, high spirit or low cunning, and, with regard to intelligence, something equivalent to shrewdness" (History of Animals, 8.1). "It is thus that man, who can subsist only in society, was fitted by nature to that situation for which he was made. All the members of human society stand in need of each others assistance, and are likewise exposed to mutual injuries. Where the necessary assistance is reciprocally afforded from love, from gratitude, from friendship, and esteem, the society flourishes and is happy. All the different members of it are bound together by the agreeable bands of love and affection, and are, as it were, drawn to one common centre of mutual good offices." The first kind of social order that is based on love and affection arises among people bound together by personal relationships of kinship and friendship. This is possible only in small groups of people who are personally known to one another. The second kind of social order is based on mutually beneficial but impersonal exchange, like trade between merchants. This can encompass large groups of people, because it does not require the close face-to-face relationships of kinship or friendship. Through most of human evolutionary history, human beings lived in small nomadic bands of hunter-gatherers who lived largely in the first kind of social order, because impersonal exchange in markets was limited. With the establishment of more sedentary societies based on farming and herding, there was more specialization in a division of labor with market exchange; and these agrarian societies became much larger. Then, over the last four or five centuries, some societies became even more dependent on extended networks of market exchange. In The Wealth of Nations, Smith explains this history as a growing extension of market relationships rooted in the natural "propensity to truck, barter, and exchange one thing for another." The final stage of this history is a commercial society. In such a society, everyone depends on the cooperation and assistance of a great multitude of people that they cannot know personally as relatives or friends, and so they cannot expect the help of others from their benevolence only. "It is not from the benevolence of the butcher, the brewer, or the baker, that we expect our dinner, but from their regard to their own interest. We address ourselves, not to their humanity but to their self-love, and never talk to them of our own necessities but of their advantages" (26-27). "Every man thus lives by exchanging, or becomes in some measure a merchant, and the society itself grows to be what is properly a commercial society" (37). Is it good for us to live in such a commercial society, where everyone is a merchant, where social relationships are organized by buying and selling? Or is it morally degrading to live in a society where everything can become a commodity to be bought and sold? In the 18th century, Montesquieu argued for "gentle commerce"--that commerce had a civilizing effect in polishing or softening manners--and thus that commercial societies would bring moral improvement. But Rousseau argued, on the contrary, that commerce would corrupt our morals. Since then, both Marxist radicals and traditionalist conservatives have taken Rousseau's side in warning that the spread of the capitalist commercial system would destroy all of the traditional values of love, family, religion, and patriotism (Hirschman 1982). On Montesquieu's side, defenders of the modern commercial society--for example, Steven Pinker in The Better Angels of Our Nature--have insisted that commerce really has improved our morals. A recent expression of the Rousseauist critique is Michael Sandel's What Money Can't Buy. Sandel complains that in a commercial society, where almost anything can be bought and sold, markets degrade morals. Not only are there some things that money can't buy, he argues, there are many things money shouldn't buy. Sandel notes that a few years ago, there was a Web site where you could buy some good-looking fake "friends" for your Facebook page. We know this is silly, because a true friendship depends on an emotional bond that cannot be purchased with money. There are other things that money can buy but shouldn't. Sandel contends that a human kidney is a possible example of this. Some people defend the idea that organs for transplantation should be put up for sale in markets. But others find this morally repugnant. A transplanted human kidney that has been bought will function as a kidney, and so the buying of the kidney has not ruined it. And yet, one might still argue that the buying and selling of human organs is morally corrupting, and that there are many goods that ought not to be exchanged in markets. It is common for economists to argue that turning a good into a commodity that can be bought and sold does not change the character of the good, but it does make the production and distribution of that good more efficient. That's why economists like to propose creating financial incentives to promote whatever behavior we might want. After all, the fundamental assumption of modern economics is that in a voluntary market exchange, both parties can be made better off without making anyone else worse off. Sandel objects to this by suggesting that as markets expand into all areas of life, including those traditionally governed by moral norms, the market commodification of goods destroys our moral motivations and promotes a social life governed by selfishness. Sandel indicates that one example of how markets crowd out morals is the study of blood donation by Richard Titmuss. In his book The Gift Relationship, Titmuss compared the British system of blood donation in which all blood for transfusion is given by donors without pay and the American system in which some blood is donated and some bought by commercial blood banks. Titmuss argued that the British system worked better and that it cultivated an altruistic sense of community, while the American system of commercializing blood created shortages and degraded the community. In response to Titmuss, economist Kenneth Arrow contended that it was a mistake to rely too much on moral motivations. He explained: "Like many economists, I do not want to rely too heavily on substituting ethics for self-interest. I think it best on the whole that the requirement of ethical behavior be confined to those circumstances where the price system breaks down. . . . We do not wish to use up recklessly the scarce resources of altruistic motivation." This sounds like Smith's claim that in those many cases where we cannot rely on benevolence to satisfy our needs, we must appeal to people's self-interest through economic exchange. Sandel objects, however, that this ignores the possibility that benevolence and other moral dispositions are increased through practice, that they are like muscles that are strengthened through exercise. If this is so, then a commercial society that relies too much on selfishness will weaken our moral character. If Sandel is right, then we might expect that the most commercial societies would manifest the most moral corruption in comparison with other societies in which markets have been less important. Some recent cross-cultural studies in experimental economics suggest that this is not true. I will take this up in my next post. Albert Hirschman, "Rival Interpretations of Market Society: Civilizing, Destructive, or Feeble?" Journal of Economic Literature 20 (1982): 1463-1484. Michael Sandel, What Money Can't Buy: The Moral Limits of Markets (New York: Farrar, Strauss and Giroux, 2013). Did the Cultural Evolution of Big Gods Make Us Moral? This sign has been set up in a public park in Arlington Heights, Illinois, near a Christmas nativity scene. This morning, the Chicago Tribune is reporting that the sign has been vandalized, and the Chicago Coalition of Reason is offering a reward of $2,000 for anyone who can identify the perpetrators. 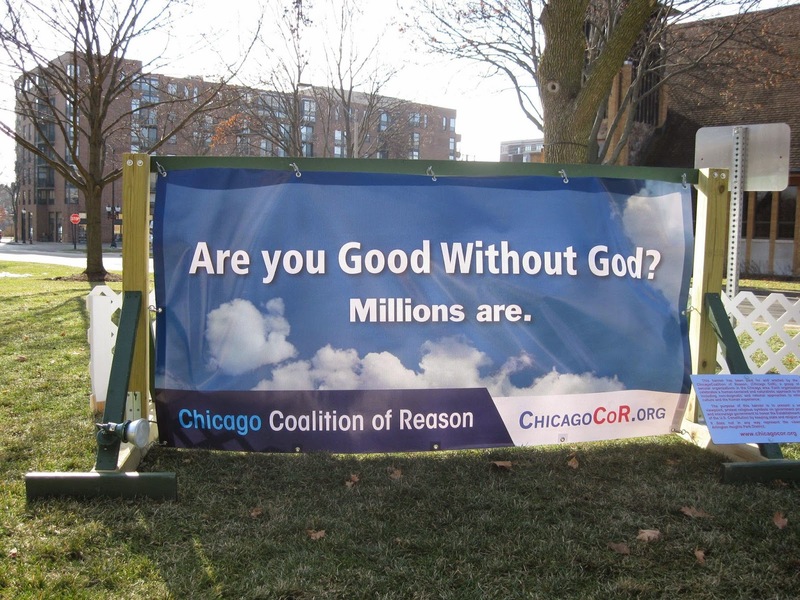 Apparently, some religious believers are angered by the claim of atheists that it is possible to be "good without God." Indeed, throughout the history of moral and political philosophy, there has been a general agreement that the moral order of society requires religious belief in the existence of a God who enforces a moral law by rewarding the good and punishing the bad. Even those philosophers like John Locke who have argued for religious toleration have been unwilling to tolerate atheists. In his Letter Concerning Toleration, Locke declared: "Those are not at all to be tolerated who deny the being of a God. Promises, covenants, and oaths, which are the bonds of human society, can have no hold upon an atheist. The taking away of God, though but even in thought, dissolves all." Beginning with Charles Darwin, this has been a controversial topic for evolutionary science. Many religious believers have argued that the human knowledge of the moral law comes from human beings having been miraculously created by God in His image, and that any atheistic denial of this must subvert our morality. For Darwin, the evolutionary history of religious belief and morality was complicated. The anthropological evidence--as surveyed by John Lubbock and others--suggested to Darwin that our earliest human ancestors in foraging societies had no belief in any omnipotent, moral God. Darwin thought that human mental faculties were inclined to an anthropomorphic animism, so that there was a universal tendency for human beings to project their own mental experience onto the world and to imagine unseen spiritual agencies around them. In the earliest stage of human evolution, "anything which manifests power or movement is thought to be endowed with some form of life, and with mental faculties analogous to our own" (Descent of Man, Penguin ed., 117). But these spirits were not omnipotent and moral deities concerned with monitoring human life. Only very recently in human evolutionary history, Darwin observed, have human beings come to believe in an all-seeing and moral God, and this has contributed to the advance of morality. This was a product of cultural evolution rather than biological evolution. This cultural evolution was driven by group warfare in which groups that were cohesive because of their shared religious belief in moralistic Gods would tend to prevail over groups that lacked such religious beliefs. And now this belief in morality as rooted in reverence or fear of God is "most important, although not necessary." Now it is possible for people to live by their own moral judgment. "Man prompted by his conscience, will through long habit acquire such perfect self-command, that his desires and passions will at last yield instantly and without a struggle to his social sympathies and instincts, including his feeling for the judgment of his fellows" (Descent of Man, 138-40, 682; Autobiography, Norton ed., 94-95). In this way, according to Darwin, the evolutionary history of morality and religion has passed through three stages. First, in the earliest and longest stage, human hunter-gatherers organized their social lives in small primitive bands through social instincts such as kinship and reciprocity, without any need for a religiously grounded morality. Then, as human beings formed large, civilized societies, they formulated through cultural evolution religious traditions of believing in omnipotent and providential Gods who enforced a moral law for human beings. Now, it is possible for many human beings to live by the inner monitor of their consciences without the necessity for believing in a God who rewards the good and punishes the bad. Over the past 40 years, the growing research in the evolutionary psychology of morality and religion has largely confirmed Darwin's account. A good survey of this research by Ara Norenzayan and his colleagues will be published in Behavioral and Brain Sciences. They develop a cultural evolutionary theory of prosocial religions to resolve two interrelated puzzles of human evolution. The first puzzle is the appearance over the past 12,000 years of large agrarian communities of anonymous strangers cooperating with one another. Our Paleolithic human ancestors lived in small foraging bands comparable to other primates, in which people could cooperate based on genetically innate propensities to face-to-face relationships of kinship and reciprocity. Those social instincts cannot explain the large societies that most of us live in today, which must be explained as products of cultural evolution. The second puzzle is the appearance of prosocial religions with Big Gods or High Gods, Gods who are more powerful, more knowing, and more moralizing than the supernatural spirits of prehistoric religion. Now the majority of human beings around the world are believers in one of the global prosocial religions--Hinduism, Buddhism, Judaism, Christianity, and Islam. Norenzayan and his colleagues argue that these two puzzles are linked. The cultural evolution of prosocial religions was one of the major causes for the cultural evolution of large agrarian states. The beliefs and practices of these religions promoted social cooperation in large communities based on the shared belief in a morality enforced by an all-powerful and moralistic God. Like Darwin, they see this cultural evolution as driven by group selection in war: groups with prosocial religions were stronger than groups without such religions. Various kinds of archaeological, ethnographic, historical, and experimental evidence support this theory. The archaeological and ethnographic evidence indicate that hunter-gatherers in small foraging bands have some religious beliefs in animistic spirits that have limited powers and little moral interest in human beings. It was only with the development of agriculture and the establishment of large agrarian societies that we see evidence of priestly religions based on beliefs in powerful, moralistic Gods that sanctify the authority of the social order. The historical evidence from ancient Mesopotamia to the present suggests that social cooperation was enforced through belief in Gods that punished the bad and rewarded the good. Beginning with Plato, philosophers have assumed that moral order is impossible without belief in moralistic Gods (as in Plato's Laws, Book 10). And in religious texts like the Bible, we can see the evolution of God from a morally dubious trickster to a universal moral lawgiver. There is also experimental evidence that believing in one of the prosocial religions promotes cooperation and fairness. People around the world playing the Ultimatum Game, the Dictator Game, and the Public Goods Game are more likely to show a sense of fairness if they are religious believers. And yet, as Norenzayan and his colleagues indicate, there is a dark side to this cultural evolution of moralistic religions. As a product of group selection, these religions show parochial altruism: believers are cooperative with their co-religionists, but they can be vicious in their treatment of those outside their religious group. Religious violence and intolerance have provoked attempts in liberal political thought to overcome the factional conflict stirred by religious belief by promoting religious liberty and tolerance in a free marketplace of religious belief (as proposed, for example, by Adam Smith in The Wealth of Nations). But as indicated by Locke, some liberal proponents of toleration have worried that moral order might be impossible without religious belief. If Darwin is right, the evolution of conscience or of what Smith called the "impartial spectator" can provide a human substitute for religious morality. Norenzayan and his colleagues agree. They argue that the spread of secular institutions since the Industrial Revolution--including economic, political, and legal norms for enforcing cooperative behavior--has begun to secure social order without the need for religious belief. They cite the example of those countries in Northern Europe today that are well-ordered although most people have no deep religious beliefs. The research of Joseph Henrich and his colleagues that showed that religious belief increased fairness in playing the Ultimatum Game also showed increased fairness in societies with market integration. People who engaged in a lot of market exchanges tended to develop expectations of fair cooperation and a tendency to punish cheaters. This might confirm Smith's suggestion that in a modern commercial society, the desire for a mutual sympathy of sentiments in a free society can generate morality as a spontaneous order without any need for divine intelligent design. If so, then perhaps we can be good without God. Ara Norenzayan, Big Gods: How Religion Transformed Cooperation and Conflict (Princeton: Princeton University Press, 2013). Ara Norenzayan, "Does Religion Make People Moral?," Behaviour 151 (2014): 365-84, available online. Ara Norenzayan, Azim F. Shariff, Aiyana K. Willard, Edward Slingerland, Will M. Gervais, Rita A. McNamara, and Joseph Henrich, "The Cultural Evolution of Prosocial Religions," Behavioral and Brain Sciences (forthcoming). Joseph Henrich, J. Ensimger, R. McElreath, A. Barr, C. Barrett, A. Bolyanatz, J. Cardenas, "Markets, Religion, Community Size, and the Evolution of Fairness and Punishment," Science 327 (2010): 1480-1484. Posts on related topics can be found here, here, here, here, here., here., here, here, and here. In the natural history of the human species, there are three eras identified by three kinds of social order. From about 250,000 to 10,000 years ago, human beings lived in foraging societies based on hunting wild animals and gathering wild plants. From about 10,000 years ago, many human beings lived in farming societies based on herding domesticated animals and cultivating domesticated plants. Beginning in the seventeenth and eighteenth centuries, some human beings in Northwest Europe and North America--first in the Dutch Republic and later in England, Scotland, and the former British colonies in America--began to live in commercial societies based on innovation generated by free market trading. Biopolitical philosophy requires a grand theory to explain the natural evolutionary history of those three eras. Explaining the emergence of the Industrial Revolution and the modern commercial society remains the subject of intense debate among economic and social historians. One point of general agreement is that commerce, trade, or capitalism were not new. Commerce is one of the world's oldest professions. There is evidence for trading networks among Paleolithic hunter-gatherers. And some of the earliest written records in ancient Mesopotamia show people engaged in business dealing. In The Protestant Ethic and the Spirit of Capitalism, Max Weber declared: "Capitalism existed in China, India, Babylon, in the classic world, and in the Middle Ages," but this capitalism did not have the same vibrant spirit as modern capitalism (Scribner's edition, p. 52). "When the division of labor has been once thoroughly established, it is but a small part of a man's wants which the produce of his own labour can supply. He supplies the far greater part of them by exchanging that surplus part of the produce of his own labour, which is over and above his own consumption, for such parts of the produce of other men's labour as he has occasion for. Every man thus lives by exchanging, or becomes in some measure a merchant, and the society itself grows to be what is properly a commercial society" (Wealth of Nations, 37). This commercial society has also been called a bourgeois society, using the French translation for a German word for those who lived in walled cities, which became the common term for those middle-class urban people who flourish in a modern commercial society. The primary cause for the emergence of this society, economist Deirdre McCloskey has claimed, was a change in ideas, so that while previously the bourgeois life had been scorned as vicious, it was for the first time recognized as virtuous. And yet there is still resistance to the idea of bourgeois virtues--from both supporters and opponents of capitalism--who assume that the bourgeois life is driven only by the vice of greed. At the beginning of Capital, Marx points to "the restless never-ending process of profit-making alone . . ., this boundless greed after riches." Recently, Thomas Piketty has lamented the growing inequality of wealth in which a few greedy capitalists control most of the wealth as an unearned inheritance. Even those on the right, like the Straussians, warn about the "problem of the bourgeois" that was seen first by Rousseau--the problem of a society that produces great wealth and a comfortable existence but without the noble virtue and heroic excellence that would elevate the soul above the level of Nietzsche's "last man." In her article, McCloskey separated the new bourgeois virtues from the older pagan and Christian virtues. The pagan virtues were aristocratic virtues embodied in heroes like Achilles. The Christian virtues were peasant virtues embodied in saints like St. Francis. The bourgeois virtues were mercantile virtues embodied in successful men like Benjamin Franklin. But in her books, she has suggested that the distinction between bourgeois and other kinds of virtues is "mere verbal shading" (Bourgeois Virtues, 350). So, for example, one could distinguish pagan courage, Christian fortitude, and bourgeois enterprise, or pagan love, Christian charity, and bourgeois affection. Generally, she adopts the traditional seven virtues of Western culture: courage, prudence, temperance, and justice as the four pagan virtues and faith, hope, and charity as the three Christian virtues. And she understands the bourgeois virtues as "merely the seven virtues exercised in a commercial society" (508). Courage tends to be ranked at the top of the pagan virtues, while prudence tends to be ranked at the top of the bourgeois virtues. But in some situations, aristocratic courage is required even in a bourgeois society. And prudence was as much a virtue for Aristotle and Thomas Aquinas as for Adam Smith. It was as true for Smith as for Aristotle and Aquinas that prudence was not the only virtue. For those economists who explain human beings as rational maximizers of utility, prudence understood as a rational calculation of one's interests would seem to be the only virtue. But McCloskey argues that the moral excellence of the bourgeois virtues requires a balance of all seven virtues. As Aristotle saw, happiness requires some development of all of the virtues. Most importantly, one needs to see that Smith never says that "greed is good." Of course, there is a lot of greed in bourgeois societies, just as there has always been greed in every human society. But there is nothing about a bourgeois society that prevents the cultivation of all seven of the traditional virtues as bourgeois virtues. On the contrary, McCloskey argues, the Bourgeois Revolution that produced modern commercial society has elevated the human moral condition in three ways. First, since 1800 the bourgeois revolution has increased the amount of goods and services for the average person around the world by about eight and a half. Even the poorest areas, as in Africa, have seen at least a tripling of average income since the beginning of the 19th century. And in those places were the bourgeois virtues have flourished the most--like the United States, England, Taiwan, and Hong Kong--national income per capita has increased by a factor of nineteen, which means an increase of eighteen hundred per cent! Keep in mind what this means: for the first time in 250,000 years of human history, the majority of human beings are not living in a condition of grinding poverty that ruins their development. The second great improvement in the human condition brought by the Bourgeois Revolution is the increase in the average human lifespan and in the human population. More human beings are living longer, healthy lives than ever before in human history. The population of the Earth has increased from less than one billion to over six billion, and amazingly most of those people are not starving. "I claim that actually existing capitalism, not the collectivisms of the left or of the right, has reached beyond mere consumption, producing the best art and the best people. People have purposes. A capitalist economy gives them scope to try them out. Go to an American Kennel Club show, or an antique show, or a square-dancing convention, or to a gathering of the many millions of American birdwatchers, and you'll find people of no social pretensions passionately engaged. Yes, some people watch more than four hours of TV a day. Yes, some people engage in corrupting purchases. But they are no worse than their ancestors, and on average better" (24). "The richer, more urban, more bourgeois people, one person averaged with another, I claim, have larger, not smaller, spiritual lives than their impoverished ancestors of the pastoral. They have more, not fewer, real friends than their great-great-great-great grandparents in 'closed-corporate' villages. They have broader, not narrower, choices of identity than the one imposed on them by the country, custom, language, and religion of their birth. They have deeper, not shallower, contacts with the transcendent of art or science or God, and sometimes even of nature, than the superstitious peasants and haunted hunters-gatherers from whom we all descend." "They are better humans--because they in their billions have acquired the scope to become so and because market societies encourage art and science and religion to flourish and because anyway a life in careers and deal making and companies and marketplaces is not the worst life for a full human being. . . ." (28-29). The way I would put this is that the bourgeois virtues secure a commercial society that is the most desirable society in all of human history, because it tends to provide the fullest satisfaction of the 20 natural desires. So, for example, four of the natural human desires of our evolved human nature are desires to love and be loved: parental care, conjugal love, familial bonding, and friendship. And as McCloskey indicates, in our bourgeois economies, over half of the purchases that consumers make are on behalf of their children, their spouses, their parents, and their friends (56-57). Bourgeois people are not solitary egoists, because, as Smith observed, "the chief part of human happiness arises from the consciousness of being beloved" (TMS, 41). But surely, critics of capitalism like Thomas Piketty will object, we cannot plausibly claim that the wealthiest people in a capitalist society are the most virtuous people. According to Piketty's data, in the United States today, those people in the top 1% of yearly income take almost 50% of the total national income (Capital, 323). The top managers of large firms are often paid tens of millions of dollars a year, 50-100 times average income. Surely, McCloskey will not claim that these rich people are 50-100 times more virtuous than others! In her review of Piketty's book, McCloskey admits that the inequality of wealth in countries like the United States probably cannot be completely justified morally based on the merit of the rich ("Measured, Unmeasured, Mismeasured, and Unjustified Pessimism: A Review Essay of Thomas Piketty's Capital in the Twenty-First Century," Erasmus Journal of Philosophy and Economics, 7 [Autumn 2014]: 73-115). She admits that it would be good if a Smithian liberal society produced the sort of economic equality that Piketty desires. But she points out that even Piketty's data indicates variation in the patterns of inequality. The recent growth in economic inequality is characteristic only of the United States, Canada, and the UK, and not of the European countries generally. McCloskey also argues that improving the absolute welfare of the poor has more moral weight than reducing inequality. Smith was egalitarian in promoting the idea of "allowing every man to pursue his own interest his own way, upon the liberal plan of equality, liberty, and justice" (WN, 664). He saw the liberty and dignity of ordinary people as based on equality of respect and before the law, but not the equality of material outcome. A liberal government will protect private property, which includes the property of laborers in their labor (WN, 138, 715, 783). And while the "system of natural liberty" will allow some people to be richer than others, it will not allow the rich to use the power of government to gain special privileges for themselves and protection from competition in the market. There will be great inequalities of property in such a free market system, but there will also be "that universal opulence which extends itself to the lowest ranks of the people" (WN, 22). Using the government to coercively redistribute the wealth, as Piketty recommends, would reduce the economic productivity that raises the welfare of the poor. The pursuit of an absolute equality of condition would create an equality of poverty. The bourgeois virtues include charity, McCloskey argues. So we rightly expect rich people in a bourgeois society to be charitable, and we should condemn them if they are too greedy. And historically, wealthy people in bourgeois societies (like Andrew Carnegie, for example) have felt a moral duty to give away their wealth for the public good. Some of my posts on related topics can be found here, here, here, here, and here. Do We Need an Extended Evolutionary Synthesis That Includes Biopolitical Science? Last month, there was a debate in the pages of Nature over whether evolutionary theory needs to be reformulated (October 9, 2014, vol. 514, pp. 161-64). This continues the debate that began in the summer of 2008 at a gathering in Altenberg, Austria, of biologists and philosophers who argued that Standard Evolutionary Theory (SET) needed to be replaced with an Extended Evolutionary Synthesis (EES). At the time, some proponents of intelligent design theory and scientific creationism pointed to this as evidence that Darwinism was "a theory in crisis." But if one looks at the papers presented at the conference and published later as a book, one can see (as I indicated in some blog posts) that EES is not a denial of Darwinian science but--as their language indicates--an extension of Darwinian thinking. This is clearly not a denial of Darwinism because it sees no need to disagree with Darwin's claim that the theory of natural evolution is superior to any "theory of independent acts of creation." Now Kevin Laland and his colleagues are restating their argument that SET is too "gene-centric," and that those drivers of evolution that cannot be reduced to genes must be studied as part of EES. There are at least four missing pieces: developmental bias, phenotypic plasticity, niche construction, and extra-genetic inheritance. In their response, Gregory Wray, Hopi Hoekstra, and their colleagues argue that all of the concepts proposed by Laland and colleagues have already been integrated into evolutionary theory, and that these concepts can even be found in Darwin's own work. For example, Darwin's last book--The Formation of Vegetable Mould, Through the Action of Worms (1881)--was a book on evolutionary niche construction, although he did not use that term. Since Eva Jablonka is one of the co-authors of the article advocating EES, I was disappointed not to see any comments on what she has identified as the symbolic system of inheritance that is unique to human beings. Such human symbolism might be seen as a form of niche construction, which would include religion, science, morality, and politics. This could be the theoretical basis for a biopolitical science. So, for example, one might argue, as I have, that the history of classical liberal philosophy has created an evolutionary niche in which peaceful cooperation and declining violence are adaptive, and this could even drive a genetic adaptation for this classical liberal niche. Some of my posts on these points can be found here, here, here, here, here, here, and here. 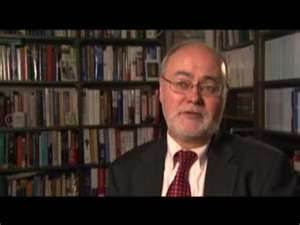 Opponents of gay marriage like Robert George have argued that if gay marriage is licensed by the government, real marriage--the marriage of a man and a woman--will be abolished. I disagree, because I think that since real marriage satisfies some of the deepest desires of our evolved human nature, it will endure as a matter of natural law, regardless of marriage licensing law. We are going to see which of us is correct, because gay marriage will soon be legalized throughout the United States. In a liberal regime, marriage should be a creation not of government but of civil society. It should be part of the social order shaped by the natural and voluntary associations of civil life, including families and religious organizations. Religious believers will want to sanction marriage as a matter not just of natural law but also of divine law. As R. R. Reno, the editor of First Things, has indicated in some recent articles, some Christians have now reached the conclusion that the proper response to the legalization of gay marriage is for priests and pastors to refuse to participate in the governmental licensing of marriage. Ministers should no longer act as agents of the state in signing marriage certificates. They should distinguish between government marriage and civil marriage, and they should agree to preside only over those weddings that conform to the Christian standards of real marriage. This would be a good step towards the best resolution of the debate over gay marriage--the complete privatization of marriage. I have elaborated some of my reasoning for this in some posts on George's arguments here, here, here, and here. I have written many posts about the debate between the Hobbesian and Rousseauean social scientists over the evolution of war. In recent weeks, there have been new contributions to that debate. On the Hobbesian side, Napoleon Chagnon and his colleagues have just published an article in the Proceedings of the National Academy of Sciences on warfare among the Yanomamo. On the Rousseauean side, Douglas Fry has just published an article in the Journal of Aggression, Conflict, and Peace Research criticizing the myths about war among nomadic foragers. The Yanomamo are an indigenous tribal population of foraging horticulturalists who live in the Amazon rainforest along the border region of southern Venezuela and northern Brazil. Chagnon is one of the most famous anthropologists who has studied them. He has provoked intense controversy with his depiction of the Yanomamo as the "fierce people" and with his claim that those men who engage successfully in lethal coalitionary warfare tend to have more wives and offspring and thus greater reproductive fitness than other men, which suggests that warfare is an evolutionary adaptation. Moreover, Chagnon also accepts Richard Wrangham's "chimpanzee model" for explaining the evolution of warfare--the idea that the common ancestor of chimpanzees and humans engaged in the sort of male coalitionary raiding that can be observed in chimpanzees. The social organization of lethal coalitionary aggression differs, however, between chimpanzees and humans. Among chimpanzees, the raiding parties are genetically related males from the same natal community. Among human foragers, the raiders are largely related by marriage rather than genetic kinship. Rather than a "band of brothers," Chagnon and his colleagues indicate, human raiding parties are a "band of brothers-in-law." The evolutionary advantage for men who form alliances for raiding is that this gives them access to their friends' female relatives as potential wives. The underlying assumption here--that warfare was an evolutionary adaptation for human foraging bands--is challenged by Fry. He argues against what he identifies as four myths: that nomadic foragers are warlike, that there was a high rate of warfare in the Pleistocene, that the data support Wrangham's "chimpanzee model" for the evolution of war, and that the establishment of formal state bureaucracy brought an inevitable decrease in the aggression in forager societies. In a previous post last year, I have summarized the five objections from Wrangham and his colleagues to Fry's arguments. In this new article, Fry responds to one of those objections. 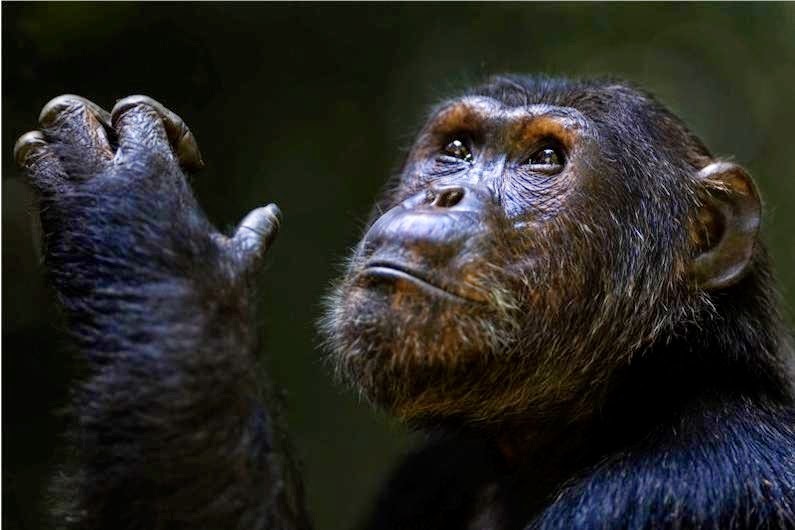 Wrangham and Glowacki have argued that in surveying the data on foraging societies, the only appropriate cases for assessing their chimpanzee model are nomadic foraging societies living next to different nomadic foraging societies, because most of the nomadic foragers studied by anthropologists have been constrained by neighboring farming societies that could dominate them politically and militarily. If one looks at hunter-gatherer societies with neighboring societies of hunter-gatherers, Wrangham and Glowacki argue, one sees a universal pattern of warfare. In response to this, Fry accuses Wrangham and Glowacki of cherry-picking their cases and thus relying on a biased sample of cases. According to Fry, this ignores the many cases that work against their argument: "For instance, ethnographic cases of forager communities living in proximity to one another but that lack raiding, ambushes, feuding, or 'shoot-on-sight' practices include the nomadic foragers of central peninsular Malaysia such as the Batek, Chewong, and Jahai (Endicott and Endicott, 2008, 2014; Endicott, 2013; Howell, 1989; Sluys, 2000), the Montagnais, Naskapi, and East Main Cree bands of Labrador, Canada (Lips, 1947), and the neighboring South Indian forager societies described by Gardner (2013)" (262). From my examination of these cases, however, I don't see how they support Fry's characterization. For example, Lips reports that the Montagnais-Naskapi bands of the Labrador peninsula of Canada were bound together by the same language and a common culture and that they had never fought a war with one another. But he also reports that they had fought wars against the Eskimo and the Iroquois (399). Moreover, Lips indicates that these bands were constrained by the authority of the Canadian government and by their economic and social dependence on the Hudson's Bay Company. Similarly, Kirk Endicott reports that the Batek of peninsular Malaysia lived under the authority of the Malaysian state of Kelantan acting through the Department of Aboriginal Affairs and the Department of Wildlife and National Parks. He also reports: "Probably the original reason the Batek prohibited fighting with outsiders was the fear that they would be killed or enslaved. Like other Orang Asli, they were victims of slave raiding by Malays during the nineteenth and early twentieth centuries" (2013, 248). Sluys reports the same situation for the Jahai of northern peninsular Malaysia. First, they were enslaved by Malays, and then they were put under strict control by the Malaysian government. Gardner reports that the South Indian foragers have been constrained first by the British and then by the Indian government. "In most instances, most have been isolated from one another for centuries, if not millennia, by farming peoples on the intervening plains" (Gardner 2013, 311). So none of these cases fulfill the conditions specified by Wrangham and Glowacki. None of these cases can serve as proxies for the nomadic foragers of the Pleistocene. Douglas P. Fry and Patrik Soderberg, "Myths About Hunter-Gatherers Redux: Nomadic Forager War and Peace," Journal of Aggression, Conflict, and Peace Research 6 (2014): 255-66. Shane J. Macfarlan, Robert S. Walker, Mark V. Flinn, and Napoleon A. Chagnon, "Lethal Coalitionary Aggression and Long-Term Alliance Formation among Yanomamo Men," Proceedings of the National Academy of Sciences, early edition (2014). Some of my previous posts on the debate over the evolution of war can be found here, here, here, here, here, here, here, here, and here.